Had a scare. On both legs just above the outer ankle bone I had lumps about the diameter of a quarter, standing up 1/2” high. As my heart rate went up they would swell and my feet hurt a lot – lot more than normal. So went to Doc. (missed night workout at this point). He knocked me to 1 workout a day for a little to let CNS get a break. (foot pain) So no night w/o today. W/O’s will bounce between day with Jer or Lance or a night with Tammy. Legs have large weak area’s in some veins (what’s the odds of same place both legs, AKA-Varicose veins). So I have to ware Compression socks or wrap them. 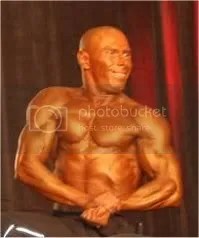 Today also is the start of my cutting for Sep. 24th Guest Posing at the 2011 INBF Cardinal Classics. 3 sets, as many as I could do. • 70 for sat. 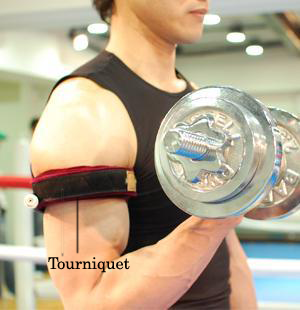 = Both arms, 2 reps with last rep a 5 sec static hold, 3 reps with last a 5 sec. s.h. , 4 reps with last a 5 sec. s.h. , 5 reps with last rep a 60 sec s.h. H.S. ISO Low Row Shrugs. • 70 x till felt like going to throw up. Plate side Delt raises, 10 reps palm down right into 10 thumb down. Night: This was about the reps and feeling the fibers doing the work. Notes: Night w/o TV interview and taping. Off everything days. No weights-No cardio. Just rest and recover. Unless its a re-feed I keep my macro’s the same as on a work out day. I will be dropping the carbs slowly as I get closer to my shows. If I hit my goal early, thats better than late. 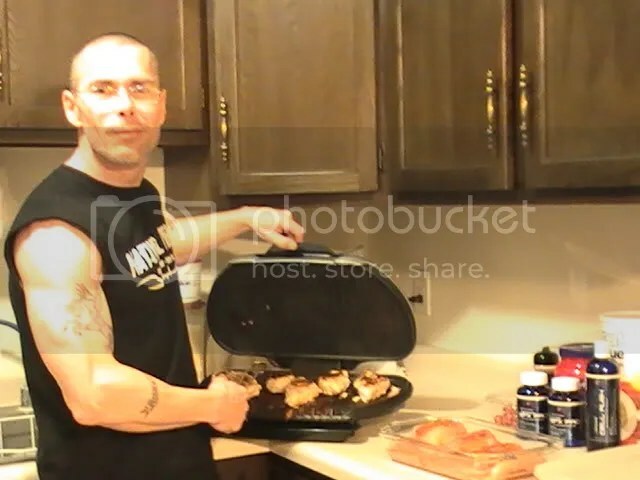 I can prop myself agenst the counter and cook up my chicken.